Bart de Ven at Tavros Yacht Marketing and co-central agent Robert Drontmann at Moonen Brokerage tell me that the owner of the 24m motor yacht White Heaven II wants her sold, with a price cut of €380,000. This Moonen 80 was built with a steel hull and aluminium superstructure and delivered in 1992. She received a new interior by Artline in 1999. White Heaven II accommodates eight guests in a master suite, VIP stateroom and two twin cabins while two 1,000hp MAN engines power her to a cruising speed of 12 knots and maximum speed of 14 knots. 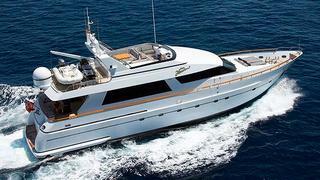 Available to view in Palma, White Heaven II is now down from €975,000 to €595,000.